Joth Ricci, former president of specialty roaster Stumptown Coffee Roasters, has been named president of Dutch Bros Coffee, the company said Wednesday. Ricci is tasked with more than doubling the drive-thru coffee chain’s U.S. presence. Ricci will work to grow the company alongside CEO Travis Boersma, who previously held the title of CEO and president. The ambitious growth plan includes expanding to 800 locations over the next five years. The privately held Grants Pass, Ore.-based chain currently operates 320 locations in seven states. 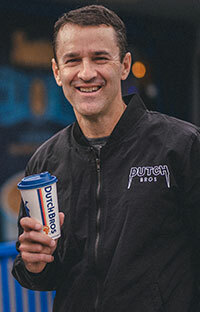 Ricci, who started his new position Jan. 7, called Dutch Bros a unique brand with a loyal following. “It’s an honor to be part of the team as we look to power Dutch Bros’ growth into new markets,” Ricci said in a statement. Prior to coming to Dutch Bros, Ricci was president and CEO of Adelsheim Vineyard in Oregon. Tapping Ricci made sense for the Oregon coffee company, founded in 1992 by Dane and Travis Boersma. Last year, TSG Consumer Partners LLC became a minority investor in Dutch Bros. Ricci worked with the San Francisco-based private-equity firm when it was an investor of Stumptown. TSG previously also had a stake in the casual-dining chain Yard House, one of its most successful investments. TSG bought Yard House in 2007 and sold it in 2012 to Darden Restaurants Inc. for $585 million in cash.